As Canada looks back on 150 years of Confederation in 2017, the role of a Canadian Horse in building the country should be underscored. But, although officially recognized by Parliament as the national horse in 2002, the breed today faces a potentially perilous future with only about 2,500 individuals worldwide. 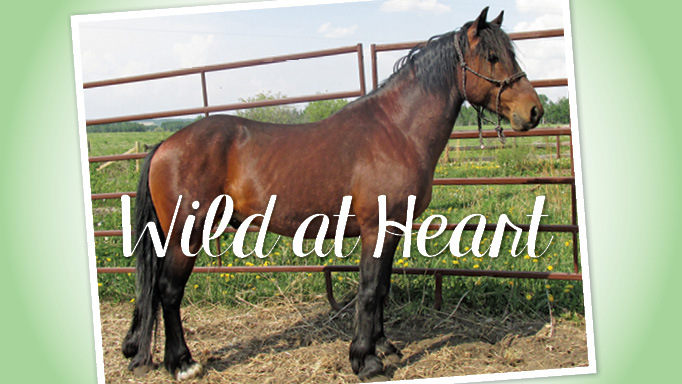 Rare Breeds Canada, a non-profit dedicated to protecting endangered breeds of farm livestock and poultry, lists the Canadian as a species at-risk. It’s also on the critical status list of comparable U.S. watchdog, The Livestock Conservancy. The breed’s population has fluctuated since its 14 forebears – 12 mares and two stallions – arrived from King Louis XIV’s private stable in France to what is now Quebec in 1665. This mix of Andalusian, Arab and Spanish Barb became the basis of a horse population that grew to 24,000 by 1784 and 150,000 by the mid-1800s. At this point, they had become an extremely robust, smaller-statured horse without influence from other breeds. The Canadian was much admired and sought after by early settlers and earned the nickname “little iron horse” for its hardiness and ability to thrive in the often unforgiving Canadian environment. Their physical strength and endurance, combined with a willingness to work, made them ideal for jobs such as driving, plowing and logging. By the late 1880s though, the population was nearly extinguished for various reasons including introduction of other breeds, mechanization and export to the United States for cavalry use during the Civil War as well as World War I and World War II. Governments attempted resurrection throughout the years, including the establishment of the first stud book in 1886, the formation of the Canadian Horse Breeders Association in 1895, an improved stud book in 1907, and a number of federal breeding programs starting in 1913. But, by the 1970s, only 400 registered Canadians existed. Since then the population has yo-yoed. The breed has this in its favour: Canadian enthusiasts are an impassioned bunch. “The obvious reason is they’re the national horse. They are a reflection of Canada. So, we have the connection to the patriotism of that,” said owner Breanne Dou Roig. The Canadian Horse has seen tough times partly because of the country’s “inferiority complex,” said Rick Blackburn, owner of documentary film production company Shootfilms and self-described “Canadian nut” – both the country and the horse, that is. One thing is certain, the passion of individuals like Breanne and Rick will be what ultimately saves the breed from demise. 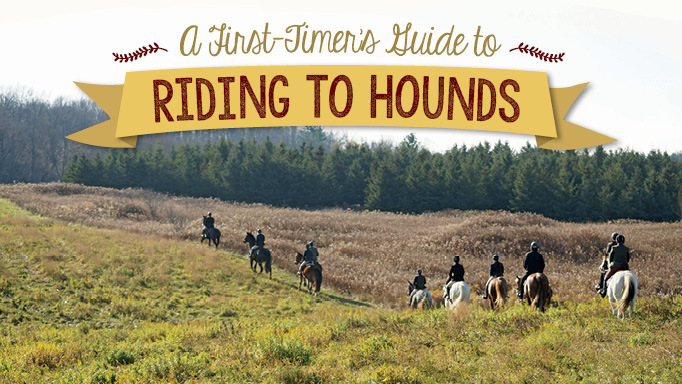 Read on for their stories about how Canadian Horses have touched their lives. Young newlyweds Breanne and Marcel Dou Roig knew they wanted to build a life together in the mountains. So, three years ago, when Marcel found a job in his field as an electrician in north-central British Columbia, they moved from Ontario to a 10-acre property in the small community of Fort St. James. This was just what she and Marcel were looking for. 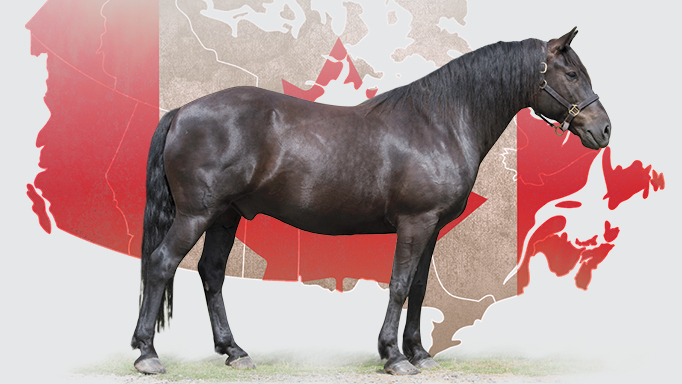 Just over a year ago, two Canadian geldings were shipped from Alberta breeder Canadian Hay Ranch to their new B.C. home. They have since become a major part of the Dou Roigs’ world. Her horse is four-year-old, 15.1-hand Blain Eros Apace, aka Ferro, Spanish for steel – a nod to the breed’s nickname “little iron horse.” Shy at first, Ferro now has a “huge” personality, said Breanne. “Teach him a trick and he’ll show it to you all the time. Tell him he’s good and he turns on the X-factor,” she laughed. It’s a trait for which the Canadian has been recognized for centuries. “The thing that makes them stand out for me is they are so diverse in what they can do. They want to do it for their person. They might not make it to the Olympics, but they’re going to try their hardest at everything,” said Breanne. Filmmaker and Canadian history expert Rick Blackburn is so dedicated to the Canadian Horse, he rode 4,000 kilometres from his home in Quebec to Texas A&M University with 50 DNA hair samples in a saddlebag to prove the breed is the foundation equine stock of North America. And he and his wife Louise Leroux created a full-length French-language documentary about the journey, La Légende du cheval Canadien or The Legend of the Canadian Horse. Rick speaks from experience about the Canadian Horse. When his family decided to get horses more than a decade ago he considered the breed as it appealed to the history lover in him. “The history of the Canadian Horse is pretty much the same as Quebec and Nouvelle France and that’s what I was interested in,” he said. Canadians seemed like a perfect fit. The gelding Galopin (Mainguy Bismark Galopin) came home first and proved his worth right away. A couple of months later came Hannah (L’Angelus Pacha Hannah), who was in foal with Tacha (Peace Haven Kurt Tacha). The herd remained a trio until a few months ago when a rescued gelding named Socrates, arrived. While researching the project, Rick contacted geneticist Dr. Gus Cothran at Texas A&M University, who was mapping the genetics of North American equines, to ask where the Canadian Horse fit into the equation. Dr. Cothran explained they had never been able to procure sufficient DNA samples to include in his dataset. Part of the problem, Rick explained, was the language and cultural gap between the Quebec French core breeders and the scientists. So, he became the link and in summer 2009 began the four-month journey to Dr. Cothran’s Equine Genetics Lab, about 155 kilometres northwest of Houston. He rode Hannah all the way, with Galopin packing necessities. His wife Louise followed in a camper. They covered about 60 kilometres a day, six days a week, mainly using original French trade routes. Perhaps even better news, the investigation showed the breed has “high values of genetic diversity.” This essentially means the Canadian has been bred responsibly, making it easier to make a population comeback without risk of inbreeding, explained Rick. As for Rick and his Canadians, he’s currently planning another long-distance ride and associated film. (Enter new pack horse Socrates!) The Heritage Canada partnered project called Canada’s Forgotten Soldiers will see him ride 8,000 kilometres across Canada to honour the nation’s war horses and those who rode and cared for them. 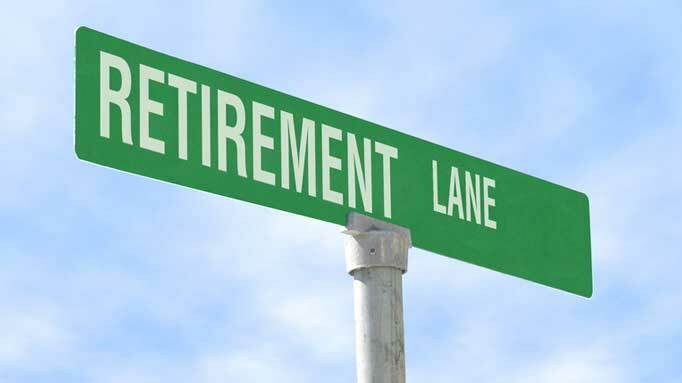 Humour columnist Doug Breen talks about the Baby Boomers’ contribution to the horse industry. 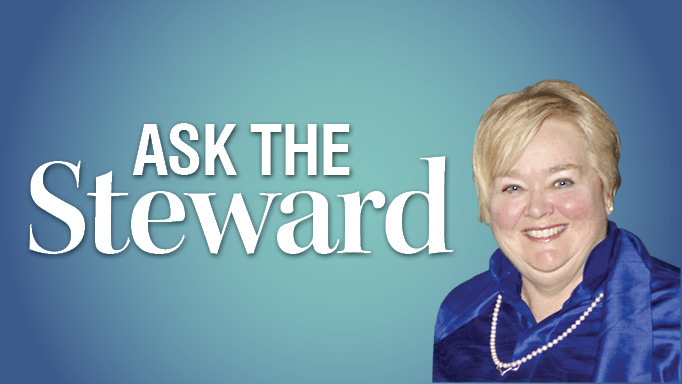 Show steward Jan Stephens answers your questions about horse show rules.